Montrose came out 5-0 winners against Dundee West in their G Taylor league fixture. Despite the mud the game went ahead as scheduled with Reece Aitken opening the scoring early on. 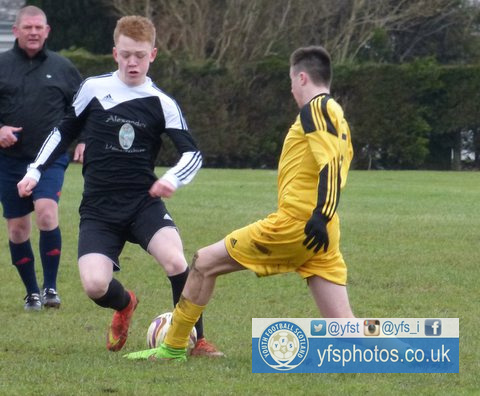 Hamish McWhinnie grabbed two goals for himself in addition to Keelan McCulloch and Laurence Bayfield netting one each. Montrose began the game with a high tempo determined to strike early. Their great start proved successful, as they only had to wait five minutes to find themselves in the lead. A Montrose corner was launched into the Dundee West penalty area and scrambled away towards the edge of the box. Unfortunately, for Dundee West, the ball found its way to the feet of the Montrose number ten, Aitken. The diminutive attacker took his shot first time and buried the ball into the bottom left hand corner of the net. A few minutes after this early setback Dundee West had an opportunity to equalize. Robbie Fleming managed to latch onto a lobbed pass just outside of goal and struck the ball first time with the outside of his foot. Fleming, however, did not generate as much power as he would have wished and the ball was eventually claimed by the Montrose ‘keeper Corry Marshall. In the seventeenth minute Hamish McWhinnie was presented with a chance. After receiving the ball he ran towards goal and attempted a curling effort from the edge of the box. The Dundee West goalkeeper, Jack Gray, successfully saved and held the ball. Three minutes later Aitken managed to intercept the ball and went on a fine run towards the Dundee West goal. He attempted to lay the ball off to McWhinnie on his left but the original pass was cut out. McWhinnie, however, still managed to gain control of the loose ball and fired a low powerful shot towards the bottom right hand corner of the net. Gray did well to parry the ball round the post and out for a corner. In the twenty fourth minute Montrose doubled their lead. Kieran Thomson played a nice long pass into Aitken. The number ten went on another successful run and managed to play a great through ball to McWhinnie, which presented him with a one on one situation. Montrose’s number six duly obliged by slotting the ball past the oncoming goalkeeper to make the score 2-0. Dundee West barely had any time to regain themselves before they were 3-0 down in the twenty sixth. A free kick was delivered into the Dundee West penalty area and ricocheted around before the Dundee West ‘keeper appeared to claim the ball. Unfortunately, due to the conditions, the ball managed to escape the grasp of the keeper and broke free to the feet of Keelan McCulloch. He duly dispatched his shot from close range to put Montrose in a dominant position. Three minutes later and Montrose’s Laurence Bayfield unleashed a fierce shot from twenty yards out. Jack Gray made a fine acrobatic save to divert the ball past the post and out to prevent his team conceding a further goal. In the thirty third minute Montrose did score their fourth goal of the match, however. Bayfield was put through in a one on one situation and shot low and hard into the bottom right hand corner past the goalkeeper Gray. Revenge, you could say, for thwarting his earlier effort. The second half saw a goalkeeping change for Dundee West with Liam Moore coming on in place of Gray. Moore was instantly called upon in the early stages of the second half to save from another Laurence Bayfield effort. Shortly after, however, in the fifty third minute Montrose grabbed their fifth goal of the game. Aitken manage to break through the defense and fired a shot at goal that was parried away by Moore. Aitken managed to pick up the rebounded ball and laid the ball off to the lurking McWhinnie. The number six struck the effort first time and it found its way into the net via a little help from the post. In the seveny fourth minute Dundee West’s Arran Laird had a chance to claw a goal back. The forward had a great run towards the Montrose goal but was forced wide of the target by the Montrose defence. With the angle against him he fired a low powerful shot that was well claimed by Marshall in goal. A couple of minutes afterwards Liam Emslie went close with an effort from a direct free kick. His shot flew just wide of the post, inches away from a spectacular sixth goal. In the final minute of the match Dundee West were given an opportunity to grab a goal for themselves. Robbie Fleming took the kick and opted for power on the shot. Montrose’s Marshall saved and held the ball very well. With that as the last kick of the game the referee blew the final whistle. Montrose deserved their three points thanks to their strong and authoritative performance. As for Dundee West they were left to reflect on what was a bad day at the office. Their league performances this year have been very good and they have the quality to bounce back from this defeat. Arran Laird – Ran the channels relentlessly and held the ball up well. Was his side’s most potent threat and his work rate was hugely commendable. Reece Aitken – Opened the scoring early on and was the orchestrator of their attacking play. Great passes and dribbling throughout and was the key to unlocking the Dundee West defence. Jack Gray’s save on the 29th minute. Fine acrobatic save and received a round of applause form the spectators. As someone who appreciates a fine clinical pass Montrose’s second goal displayed just that. Great ball to put McWhinnie through on goal.